During the next few weeks, I will post some articles in the forms of chapters of a book about flat figures. These articles gonna cover everything from how and where to buy these small fellows, how to choose among what is available, different techinques of painting them untill the time of dispalying them. In addition, every chapter is gonna contain a selection of photos from well known or not so well know artists, demonstrating different techinqures or simply dispalying amazingly painted flats. Here is a sample of what is coming up. 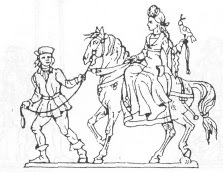 30mm figure from the Landshuter Hochzeit (1400 - 1500) range by Golberg.